It's Swedish. Free from lactose, milk protein and soya. 100% cool for vegans. Hey barista this one's for you. So you are a barista? Cool. We are the company that made the first oat drink. Also pretty cool. Anyway we thought you might be interested in this carton of barista edition oat drink. It's based on liquid oats which means it isn't overly sweet or excessively heavy. What it is, is fully foamable putting you in total control over the density and performance of your foam so you can showcase your latte art skills, sorry we mean skills. Anyway, give it a try and see what you think. We are here for you from now on, whenever you are ready. Hey non-barista this one's for your (too) If you want a really nice latte that doesn't contain milk from a cow you have a couple of options. You could snap a photo of this package and show it to your barista or you could buy this carton and make one yourself. 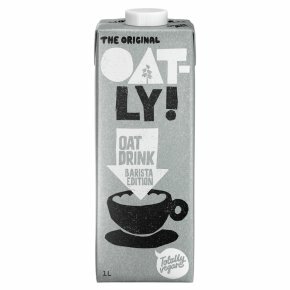 Just heat this barista edition oat drink (for non-baristas too) in a container while giving it a whirl until if foams up nicely and then pour. And since you are a non-barista you will be happy to know this product tastes just a amazing if you drink it straight or pour it on your granola or put it to work with your cooking skills. But let's keep that to this side of the carton, okay? Shake me!